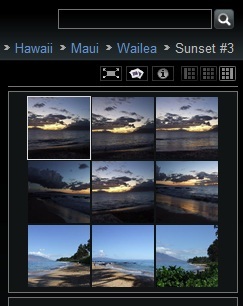 Sidebar block to add thumb based navigation in Photo pages. Uses 3xN grid to display items from each side of currently displayed. Total number of thumbs displayed is configurable. Default is set to 9. Unpack content in modules folder. Activate the module: Login -> Admin -> Modules. Check the box next to the module. Click update at the bottom of the page.